Kick off your visit on the 11th (Mon): tour the pleasant surroundings at Hammamet Beach, wander the streets of Yasmin Hammamet, and then don't miss a visit to Medina of Hammamet. For photos, where to stay, traveler tips, and tourist information, go to the Hammamet trip itinerary planning tool . Dubai, United Arab Emirates to Hammamet is an approximately 13-hour combination of flight and bus. You can also drive. The time zone difference moving from Gulf Standard Time to Central European Time is minus 3 hours. 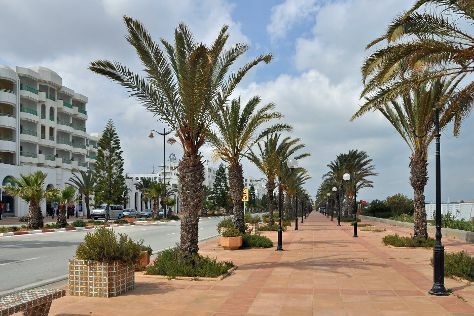 In February, Hammamet is slightly colder than Dubai - with highs of 19°C and lows of 9°C. Wrap up your sightseeing on the 11th (Mon) to allow time to travel to Tozeur. Start off your visit on the 12th (Tue): explore the fascinating landscape at Sahara Desert and then contemplate the waterfront views at Chott El Jerid. For photos, traveler tips, and tourist information, you can read our Tozeur trip planner . Getting from Hammamet to Tozeur by combination of bus and flight takes about 5 hours. Other options: drive; or take a train. 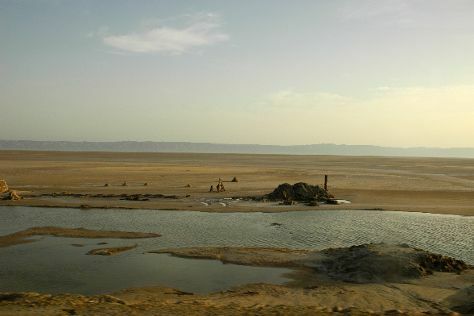 In February, daytime highs in Tozeur are 22°C, while nighttime lows are 9°C. Wrap up your sightseeing on the 12th (Tue) early enough to travel to Djerba Island. Kick off your visit on the 13th (Wed): examine the collection at Musee du Patrimoine Traditionnel Djerbien, stroll through Ranch Yassmina Djerba La Douce, then stroll around Krokodilfarm Animalia, then don't miss a visit to Djerbahood, and finally take in the spiritual surroundings of El Ghriba Synagogue. To find photos, ratings, other places to visit, and more tourist information, use the Djerba Island trip itinerary maker website . Getting from Tozeur to Djerba Island by combination of flight and taxi takes about 1.5 hours. Other options: drive; or do a combination of taxi and bus. In February in Djerba Island, expect temperatures between 21°C during the day and 11°C at night. Finish your sightseeing early on the 13th (Wed) to allow enough time to travel back home.